As we saw on Thursday night, some of the best college programs at producing high draft picks were at it again. The Duke Blue Devils had the No. 2 pick in the 2016 NBA Draft in Brandon Ingram, while the Kentucky Wildcats saw plenty of players fly off the draft board as well. It was an interesting draft night filled with a whole lot of surprises, strategically great picks, and choices surrounded by scrutiny. All in all, it was an intriguing draft — one that should feature quite a few players who will contribute big time during their NBA careers. With that said, there were obvious winners and losers from the night. We’re going to break down the four biggest winners and four biggest losers of the 2016 NBA Draft. Let’s kick it off with a team who had a high draft pick and used their picks well. First, the Buddy Hield selection was an incredible one. He is the third-best player in this draft class, maybe fourth behind Kris Dunn. Regardless, the Pelicans got exactly what they needed in Hield, who is an outside shooter, a spot-up shooter, and someone who can create their own shot if absolutely needed. Pairing him up with the talent New Orleans already has, including big man Anthony Davis, will create plenty of great looks for Hield. This may have been one of the best picks of the draft. Tacking onto the Hield selection, the Pelicans also drafted Cheick Diallo, who will bring a ton of energy and eventually help ease some of the pressure off Davis inside. Diallo may not be a huge contributor from day one, but he will be a nice addition. Lastly, we mention an overlooked move. Anthony “Cat” Barber from NC State went undrafted, and the Pelicans immediately pounced. According to Scout.com, Barber signed with the Pelicans, and he will continue to surprise a lot of people as a guy who averaged 23.5 points, 4.6 rebounds, and 4.5 assists last season. Barber can create his own shot and might be a huge steal. We won’t spend a ton of time here, because the Hornets weren’t losers in your typical NBA draft fashion. Instead of making a terrible pick, they decided to trade away the No. 22 selection to the Sacramento Kings for Marco Belinelli. If the team had been able to add Jeremy Lamb or Spencer Hawes to the deal, this might have made sense. Unfortunately, it doesn’t make any sense, because Belinelli is nothing more than an outside shooter. The Hornets did nothing else, but hurt themselves by not being able to move either of those painful contracts with free agency looming. The Pistons are looking really good right about now. Not only should their young core make fans pretty excited, but they also added two players who we absolutely love. 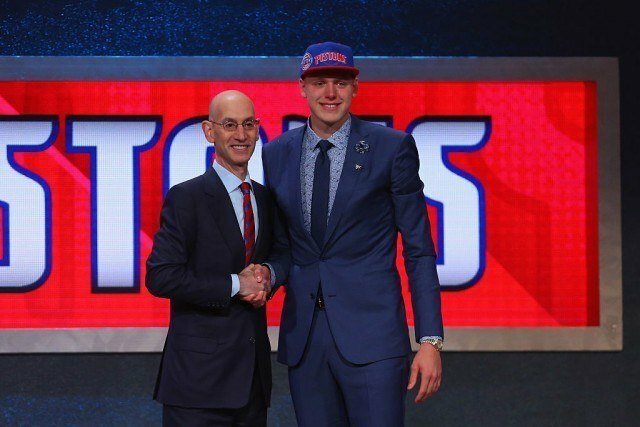 Henry Ellenson should have been a lottery pick, but they landed him at No. 18 overall. To top it off, the fact that the Pistons got Michael Gbinije from Syracuse at No. 49 is unreal. Gbinije is a great basketball player; one who improved over his four years in college. His final year with the Orange featured him playing 37.9 minutes per game, while averaging 17.5 points, 4.3 assists, 4.1 rebounds, and 1.9 steals per game. Gbinije can do a little bit of everything, and will make an impact for Detroit off their bench. Thon Maker at No. 10. This guy hasn’t played basketball after high school, which alone makes this pick drastically scary. The Bucks need instant-impact players, and Maker won’t be one of them. Overall, the pick here just makes zero sense. Honestly, if the Bucks wanted Maker that badly, they could have traded back. That doesn’t really happen in the NBA draft — it’s more likely in the NFL draft — but it still could have happened. Maker’s addition makes little sense. While the second-round pick of Malcolm Brogdon wasn’t bad, it’s the lottery pick that the Bucks had that really put them here. Welcome back, Kevin Durant. There’s reason to believe that the addition of Victor Oladipo, as well as the No. 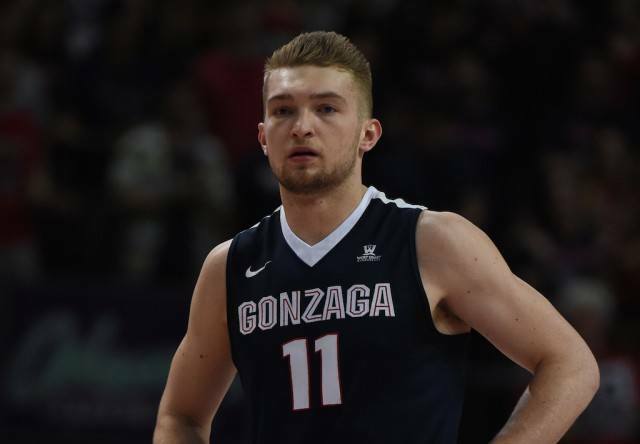 11 pick Domantas Sabonis could be enough to entice Durant to re-sign with the Thunder. The fact is, getting Oladipo, who can get it done on both ends of the floor, was a beautiful thing. Trading away Serge Ibaka wasn’t the biggest deal, largely due to the fact that Ibaka found himself watching Durant and Russell Westbrook more often than not — which isn’t his fault. The Thunder made great moves that we absolutely love, but the most important part was that they gave Durant a reason to want to stay. Nice job, Oklahoma City. With that said, enter the Magic as one of the losers of the night. Trading Oladipo is tough — we just don’t like it. While Ibaka has talent, and will be a better fit in Orlando, the Magic gave up a bit too much for him. For a young, rebuilding team like Orlando, the idea of getting Ibaka, who has just one year left on his current contract, doesn’t make a lot of sense. There’s a chance that they may have just traded for a big man who’s going to leave town after 2016, and it’s hard to like that. If you’re a Magic fan and you liked Oladipo, then you’re probably pretty mad. If you’re a Magic fan and you didn’t like Oladipo, then you’re probably just as confused as we are. How weird is this? The 76ers were one of the night’s big winners, and rightfully so. They made the obvious and correct choice with Ben Simmons at No. 1, but also added two interesting players in Timothe Luwawu-Cabarrot (SF, France), and Furkan Korkmaz (SG, Turkey). Neither of those two names are probably well-known to most NBA fans, but they’re strong additions. Luwawu is athletic and should be a nice piece of the puzzle, while Korkmaz has the ability to knock down shots from the outside, which is a great thing to pair up with Simmons and the many big men Philadelphia has. What is going on? The Kings have big men DeMarcus Cousins and Willie Cauley-Stein, yet they drafted two centers in the first round? While Skal Labissiere at No. 28 is hard to pass up, simply due to the upside, it’s still tough to gauge what Sacramento was thinking. Georgios Papagiannis from Greece was their first center at No. 13; then the Kings went with Malachi Richardson (SG, Syracuse) at No. 22; then Labissiere; and finished it up with a second-round pick of Isaiah Cousins (SG, Oklahoma). We like both Richardson and Isaiah, that’s not the real knock here. It’s about the center decisions. To top it off, it’s unknown if either Richardson or Isaiah will be able to contribute right away for the Kings, which is what they drastically need. Oh, and any idea who plays point guard next season behind Darren Collison?